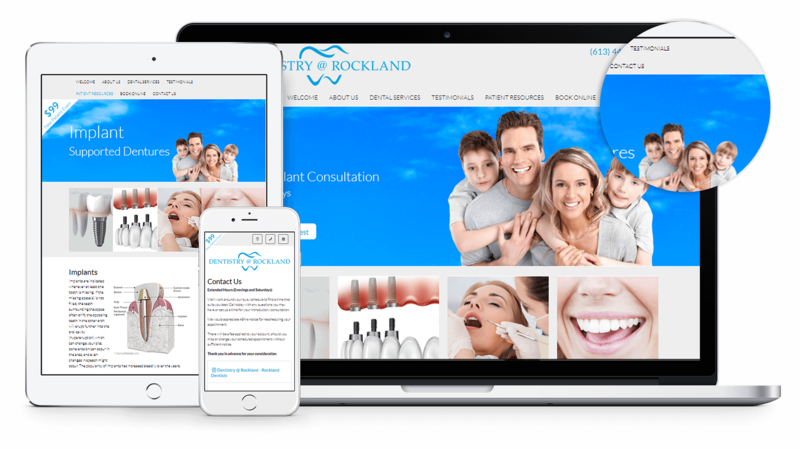 We have just launched a brand new dental website for our client in Rockland Ontario. The website comes with some very interesting features and latest technology. We just launched a new dental website! Dentistry at Rockland is a convenient family friendly dentist clinic, provides complete exams, cleanings and fillings, tooth extraction, Emergency care, braces, teeth whitening, and local cosmetic dentistry services. Their focus is on catering to every individual`s needs for them to have a pleasant and positive experience. Patients have access to multiple images giving them a visual of the dental office, they can browse for any dental services needed and make appointments just by completing a form online. There is also a News and Events section where the practice posts all the extra events they hold along with pictures from the events. New patients also have the ease of mind by visiting the “Dental Videos” page where they can watch firsthand different types of procedures in order for their first visit to not be intimidating. The webpage has a very inviting layout, built for easy navigation and is compatible with all screens from any device such as desktop, tablet or smartphone.